This is an 8 x 14 inch, four color, folded to pocket size tract. The inside shows a panoramic view of the Bible from Eternity Past to Eternity Future. It displays past, present and FUTURE EVENTS (all with Scripture references). It charts Satan's path; - past, present and future; Israel's history and future and the resurrections for both the saved and un-saved of all ages (all with Scripture references). The back side of the Bible Map is a quiz so readers can examine their faith and compare their answers to God's Word. This side is widely used in Personal Evangelism. 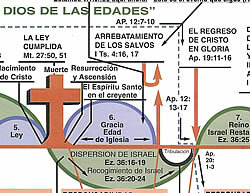 Shown below is part of the 4-color chart inside the "BIBLE MAP - God's Plan of the Ages" tract. We are now living in the GRACE age. It began with the death of Christ and will end with the return of Christ in His glory at the end of the 7 year Tribulation Judgment. His return can NOT be dated, but He WILL return, because He promised!